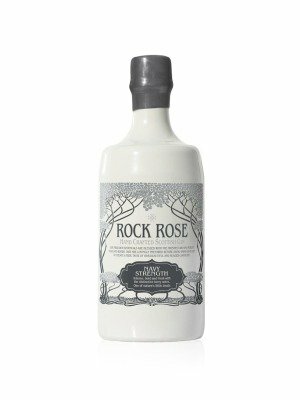 Rock Rose Navy Strength Gin is a popular Craft Gin available from TheDrinkShop in 70cl to buy online. Visit TheDrinkShop for the best price for 70cl of Rock Rose Navy Strength Gin or compare prices on our other Craft Gin products. Rock Rose Navy Strength is the slightly stronger sibling to the delicious Rock Rose Scottish Gin. Although boasting an ABV of 57%, the Navy Strength Edition exposes more earthy, nature-inspired notes, rather than a pure hit of alcohol. With a strong, warm pine release at the front of the drink and notes of lemon sherbet, this gives way to bold berries, rowan and hawthorn before picking out the deeper notes of angelica and orris apparent in the original Rock Rose. A gin to sip and savour, powerful juniper reminds us of a hot summer walk in a forest. Excels in a negroni cocktail. Where to buy Rock Rose Navy Strength Gin ? Rock Rose Navy Strength Gin Supermarkets & Stockists. You can buy Rock Rose Navy Strength Gin online in most retailers and find it in the Craft Gin aisle in supermarkets but we found the best deals online for Rock Rose Navy Strength Gin in TheDrinkShop, Amazon.co.uk, 31dover.com, and others. Compare the current price of Rock Rose Navy Strength Gin in 70cl size in the table of offers below. Simply click on the button to order Rock Rose Navy Strength Gin online now.